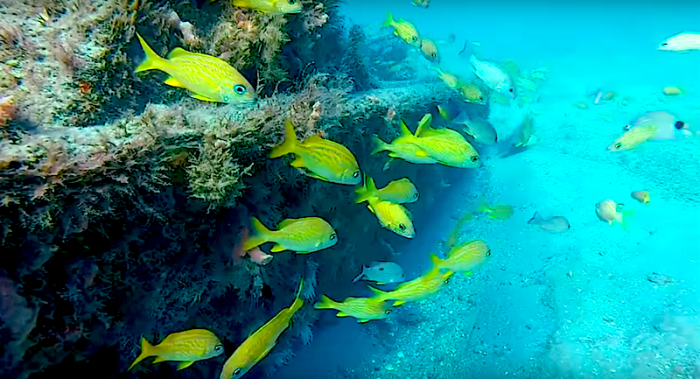 The Blue Heron Bridge is a world famous dive site in Palm Beach, Florida. The site is unique and a paradise for snorkelers, divers and underwater photographers. The Blue Heron Bridge is home to 400 different species and was voted the best dive site in the world in 2013. Yet the aquarium industry was allowed to harvest thousands of tropical fish, leaving the dive site empty for months. Protest. Share this message! A group of divers were at the Blue Heron Bridge last week when a large truck parked in front of the dive site. Four young men, employees of an aquarium company in Texas, got out. From that moment on, Blue Heron Bridge changed into a harvesting site for the aquarium industry. Large nets, buckets and professional collection boxes appeared and in a weeks time thousands of fish are removed. When bystanders warn the authorities, their work turns out to be perfectly legal. Divers from Florida make an urgent appeal on Facebook to share the scandal en masse. "Pike blennies all gone," they write on their page, "file fish all gone, bat fish all gone, frog fish all gone." Blue Heron Bridge is empty. Do you share their ioutrage? Then share this message? Have you ever dived at Blue Heron Bridge? Leave a message. If not, find out more about this unique dive site. is a world famous dive site in Palm Beach, Florida. The site is unique and a paradise for snorkelers, divers and underwater photographers. The Blue Heron Bridge is home to 400 different species and was voted the best dive site in the world in 2013. Yet the aquarium industry was allowed to harvest thousands of tropical fish, leaving the dive site empty for months. Protest. Share this message!